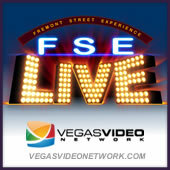 As we begin episode four of FSE LIVE, the D’s Derek Stevens (co-owner/CEO) describes the huge effort that transformed Fitzgeralds Casino & Hotel to the D. Derek also announces some breaking new about upcoming additions to his property. Say “FSE LIVE” get a FREE Labatt Blue Beer at the Long Bar! WHERE YOU FROM?!? :How do you select that bands that play on FSE? Stayed at the D Nov 6th through the 9th. Nice place ,good rooms,great bartenders, but no restaurants . Only Mcdonalds and coney dog place. Kinda sad. You had to leave to get something to eat. Should have spaced the openings better. Derek announces a new restaurant in the show! not let people know when they book a room. What restaurants did they have before the remodel? Love downtown and love the show. How about a segment that features dealers or floor people talking about some of their most memorable moments at the tables? Might be about a big bet, some the unusual folks who play, how to get credit, etc. Thanks for the kind words, Randy. Interesting idea for a segment. I’ll look into it!